A Japanese space capsule perhaps carrying the first eversample from an asteroid is on track for a Sunday parachute landing in SouthAustralia. The Hayabusa spacecraft is on-target, nearing completion ofa seven year round-trip sojourn to asteroidItokawa - a $200 million technology demonstration mission undertaken by theJapanese Aerospace Exploration Agency (JAXA). ?The mood here is very good. The [Hayabusa] trajectorycorrection maneuvers have gone very well and we are really getting ramped upnow to prepare for our search and recovery operations,? Abell told SPACE.com. ?There is a real air of optimism and excitement.? Abell described the scene in Australia, with JAXA havingroughly 60 people to help with the entire operation. Some of them have alreadybeen deployed to remote sites to observethe capsule as it comes in to Woomera. JAXA has set up special sensorstations to monitor the incoming sampling capsule. ?Our NASA team is basically four strong and we are here andready to assist with recovery operations in the event of an off-nominalreturn/landing. There are about 20 Royal Australian Air Force personnel here aswell, helping to coordinate the recovery operations at the Woomera Test Range,?Abell explained. Flying high above the landing zone, the NASA-sponsoredHayabusa Re-Entry Airborne Observing Campaign is to record the re-entry anddestruction of the spacecraft proper and also track the thermally-protectedreturn capsule as it heads for terra firma. Following its fireball fling with Earth?s atmosphere, thehope is that the sampling capsule safely parachutes down into a pre-determinedellipse within the Woomera Prohibited Area (WPA) ? a large zone of remotelandscape dedicated to weapons-testing in central South Australia. ?The plan is to find the capsule, assess its condition, andthen transport it back to the Range Control Center of the Woomera Test Range,?Abell said. ?Once there it will be examined briefly and then put on an airplanebound for Japan.? In Japan, the capsule is to find a home at JAXA?s samplecuratorial facility in Sagamihara, Japan. At that site, the capsule will beinspected in detail and then opened in a laboratory clean room. JAXA?s Hayabusa team has done a tremendous job and theyshould get lots of credit, Abell said. ?It truly is a heroic effort on theirpart to bring the spacecraft back to Earth,? he concluded. Abell said the Japanese mission has yielded a bonanza oftechnical and scientific information. ?Hayabusa has paved the way for future asteroidmissions, both robotic and human,? Abell noted. The lessons learned fromthe JAXA effort will be useful for close proximity operations at selectedasteroids and in designing spacecraft destined to survey those objects in thefuture. ?The data from Hayabusa of asteroid Itokawa hasrevolutionized asteroid science. We have a whole new paradigm now from which towork in trying to understand these small near-Earth asteroids,? Abellconcluded. In late 2005, Hayabusa studied asteroid 25143 Itokawa forroughly three months, transmitting outstanding imagery and science data aboutthe object. During that time, two surface sample runs were carried out. Although Hayabusa did make contact with asteroid Itokawa,the probe?s sampling device failed to successfully operate. Is it possible that the spacecraft?sreturn capsule is coming home empty of precious cargo?? ?This is a very difficult question to answer,? explainedJAXA?s Hitoshi Kuninaka, during a June 8 media briefing hosted by theAustralian Science Media Center. He is one of the most senior members of theHayabusa project team currently in Australia in preparation for the capsule?sreturn to Earth. Kuninaka pointed out that the asteroid?s surface gravity isso low that scientists think the spacecraft kicked up material on contact withItokawa, with bits of the asteroid drifting into the sample container. Also anxiously awaiting Hayabusa?s return in Australia isNASA?s Michael Zolensky, curator of stratospheric dust in the AstromaterialsResearch and Exploration Science directorate at Johnson Space Center. Zolensky said that there?s good reason to expect that justthe process of landing on the asteroid would have coated the inside of thespacecraft with dust. If so, even microscopic grains of dust will speakvolumes. ?In fact, Hayabusa is probably going to return less than agram of sample, at the most a few grams?possibly much less than that,? Zolenskyadvised. Nevertheless, an incredible amount of science can be done with asample that small. A harvest of even just a sand-sized amount of material wouldbe a fantastic treasure trove for scientists to examine, he said. For a year, a team of largely Japanese scientists and some researchersfrom other countries will be studying the samples prior to their release to?anyone on the planet who is qualified to study them,? Zolensky observed. 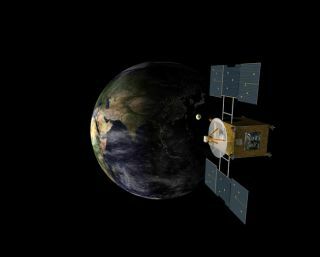 In many ways, Hayabusa is a robotic equivalent to the Apollo13 saga in which ground teams and onboard intelligence overcame a slew oftechnical snafus to return the aborted mission home. For the Japanese probe, it has endured malfunctioningreaction wheels used to stabilize the craft?s attitude, a fuel leak of itschemical engine, loss of communications for over seven weeks, and woes with itsion engine propulsion system. JAXA?s Kuninaka flagged the fact that Hayabusa?s Earthreturn was originally slated for 2007. That extra time in limping home adds up to severallast-minute worries. Will the devices that need to fire to separate the landingcapsule from Hayabusa function? This event is to occur three hours prior toreentry at some 40,000 kilometers distance from Earth. Another nail-bitter is whether the sample capsule can thenperform self-generated duties, such as parachute deployment. ?Yes, we have concerns,? Kuninaka said. Leonard David has been reporting on the space industryfor more than five decades. He is past editor-in-chief of the National SpaceSociety's Ad Astra and Space World magazines and has written for SPACE.comsince 1999.